Coaches often refer to the 5 points of pressure when holding and securing a football. Skill players must control the football at all times, especially when running through the middle of the defense. Fumbles occur when one of the points of pressure are typically lacking, which can result in a turnover. What are the 5 points of pressure? The 5 points of pressure for a ball carrier are fingertips, palms, forearms, biceps and chest. “Ball security is job security”. A phrase often echoed by running back coaches throughout the country. Running backs have enough to worry about with dodging defenders, focusing on their footwork and following blocks. The last thing they’re thinking about is properly holding the football. As the innovation of the spread offense and complex play calling and signaling continues to unfold, single set backs are expected to be able to run outside and inside the tackles. Inside the tackle typically results in a power or inside zone scheme – which usually requires a certain skillset. Outside the tackle runners often have the sideline to help them, which they’re then able to see any defenders coming from the football on the inside. When we say “inside” we’re referring to inside the tackle box. In power schemes and inside zone schemes, linebackers and defensive lineman are coming from all angles. Running backs typically cover the ball with 2 hands and lower their shoulder to pick up tough yardage. These types of running backs used to contact within the first 5 yards of scrimmage, which has them more conscious of securing the football. Above is an example of how players are often absorbing contact through the middle of the field. Protecting the ball with 2 hands can be beneficial inside the box. On thing that is lost when a player runs with 2 hands, is speed. Because the player’s hands are both covering the ball, they’re not able to reach full stride length. For what the running gains in ball security, they lose in speed. Open field and outside the tackle box is often times where fumbles occur. The ball gets away from the runners body as they turn into a sprint. As shown in one of the images below, LeSean McCoy is the greatest example of this. A primarily outside/off tackle runner, the ball is often floating away from his side and neglects the 5 points of pressure. The 5 points of pressure is the most common teaching technique for running backs to understand how to hold a football properly. When running back’s fumble, it’s usually cause by one of these pressure points not being secure – whether it’s being ripped out of a helmet knocks the ball loose. 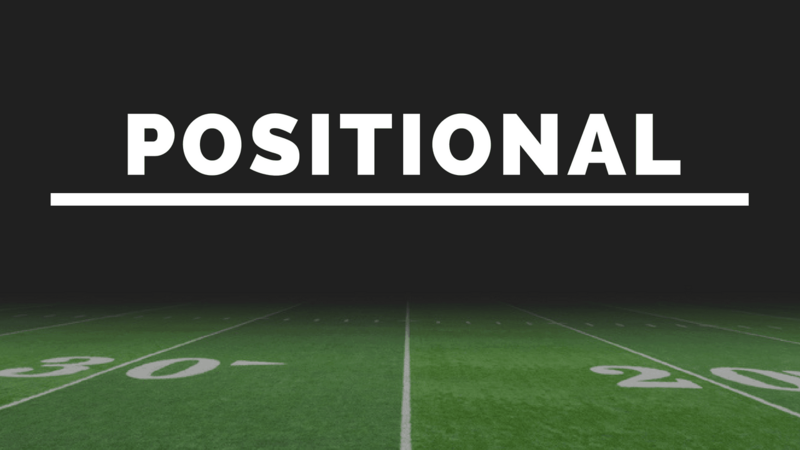 One more thing before we dig into the points of pressure – it is crucial that the ball always be toward the nearest sideline. This helps that if the ball is knocked loose, it will potentially go out of bounds. The fingertips should be placed at the top of the football. Teaching players to “claw” the ball (When the ball is placed between the middle and index finger – shown above) is a known technique to ensure the finger pressure is distributed evenly. The fingertip positioning on the football is crucial when the running back takes the hand off. Fumbles are often lost due to poor finger (and palm) positioning. The palm should close on the football so weight is evenly distributed between the left and right side of the hand. 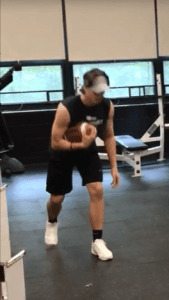 It’s important the running back gets a feel for the football, as a poor palm grip will result in sloppy transitions from quarterback to running back. As mentioned with the fingertips, the ball must have a snug fit on the palm. Fingertip and palm strength work hand and hand (literally) with securing the football on contact. The palm should always be upright on contact. When a defender puts their helmet on the football, it will shake loose if the running back’s palm is facing the sky. Forearm/Bicep pressure is one of the most important pressure points. If the ball isn’t properly fit in the forearm/bicep area, the ball will get punched out. Younger players tend to have a bad habit of letting the ball get away from bicep pressure, which leaves the football out in the open. A great example of this is watching LeSean McCoy handle the football. LeSean is able to get away with this because of his great ability to make defenders miss. However, if he was an “in-between the tackles” runner, we’d see a high majority of fumbles. This is also one of the worst habits we see in younger players. They try to emulate LeSean and think it’s perfectly fine to have the ball swinging around like he does. If you’re a youth coach, or a father of a younger player, fix this habit immediately so it doesn’t grow old with them. Similar to pressure from the forearm and bicep, pressure against the chest prevents the ball from leaking out on contact. This type of chest pressure is often the most difficult to teach, strictly because players have a natural running habit of swinging their arms by their side. Pinning the ball up against the chest ensures that when a player absorbs contact, the ball will stay nestled in the players grip. Defensive players are often taught to put their “nose” on the football. This is where players fumble occur as the ball gets away from the chest on contact. Fumbling can be drastically reduced by practicing these 5 points of contact every day. Practice these drills against air as well as against against bag and player contact. The tool seen in the tweet above is the Rae Crowther Shell Stick which can help players absorb contact and hold on to the football. When using the Shell Stick or players, it’s important to have an extra player, standing off to the side, pick at the football. Ball carriers have the tendency to loosen a point of contact or bring the ball away from their body when absorbing a hit, resulting in a fumble. What are your thoughts? 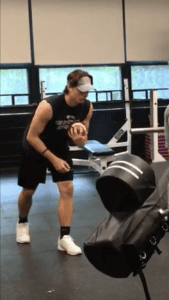 Do you have a different way to teaching young players how to hold the football? Do you have any key points in making sure ball security is always on the running back’s mind? We’d love to hear it! Be sure to comment below and give us your insight – as we love learning about new ideas! Want to learn more football? Visit our football blog to learn more about this great sport!